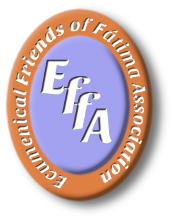 Pilgrimage has been one of the main objects of EFFA since its formation. Each year we organise a pilgrimage to Fátima lasting about ten days and coinciding with the major festival on the 12th and 13th of May. These pilgrimages are open to both members and non-members of EFFA; usually about half of our pilgrims are non-members. Pilgrimages are led by senior clergy within the Church of England, in 2012 by the Bishop of Ebbsfleet, the Right Reverend Jonathan Baker and in 2013 by the Bishop of Richborough, the Right Reverend Norman Banks. During the pilgrimage we celebrate Mass each day and have the opportunity to listen to several keynote addresses and take part in the discussions that follow them. Keynote addresses have ranged over such subjects as 'Our Lady, inspiration for the Religious Life', 'Our Lady, inspiration for parish life and work' and 'Our Lady, inspiration for Christian Unity'. Mass is celebrated in the chapel of the Sanctuary of the Verbo Divino, in the chapel of the Vida é Paz Community as well as in the chapel at the Sao Paulo pension where we stay. Because of our association with the Vida é Paz Community we always make a point of visiting their centre at least once during the pilgrimage. It provides an opportunity to meet some of the volunteers and to learn more about their work, as well as to say a Mass in their chapel. Of course, a pilgrimage should not be all about religion - fun is also a vital ingredient! And to that end we offer several optional excursions, often to the nearby town of Óbidos and to the seaside resort of Nazaré. Fátima is situated among rolling hills and fertile farmland about 111km (69 miles) north of Lisbon. It is said to have been named after a Moorish princess (Fāṭimah in Arabic means ‘one who weans an infant’ or ‘one who abstains’ ), and was a small village until 1917. Now it is a thriving pilgrimage centre, with a permanent population of 11,500 and a population of many hundreds of thousands during the major festivals. It has been compared with other great places of pilgrimage such as Lourdes or Walsingham, but it has its own unique style that draws pilgrims back again and again. People come here from Germany, Italy, Poland, Ireland, and many countries from beyond what once was the Berlin Wall. Shrines of Fatima can also be found in many eastern countries, including Russia, China and Japan. 'Global' seems to be the right description for this place, which Pope John called 'the Altar of the world'. Fátima is a twentieth century shrine, and the architecture and general layout of the place clearly reflects that. The soaring pinnacles and colonades of the Basilica blend surprisingly well with the frank modernity of the other buildings, and the scale and grandeur of it all is breathtaking. Modern sculpture, paintings, bas reliefs and gilding abound and it seems as though some treasure is to be found around every corner. The overall impression is one of light, air and spaciousness. “The devotion of the pilgrims is awe-inspiring. Their behaviour during the lengthy ceremonies is impeccable while many of them, when the major ceremonies are not filling the Sanctuary, traverse the length of the esplanade on their knees while reciting the rosary.